Eddie just arrived from the Orlando race track. We have been waiting on him to arrive because we placed a couple of his littermates, his sister Leslie and his brother Lazaras. When we heard he had the same great personality we made sure we got him too. 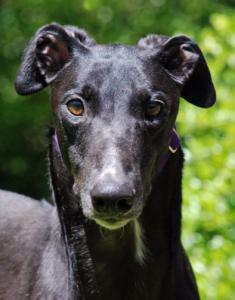 Eddie is a gorgeous, shiny, black male with white toes and a white tail tip. His sire is the very famous Flying Penske and his dam is Kelso's Isabella. Eddie raced at 76lbs and only raced 8 races. He is young and won't turn 2 until May 4th. His trainers say that he is very smart like his littermates. Although he was at the track only a short time he quickly learned how to open the latches on the gates. Eddie is very calm and good on leash. He travels very nicely in a van and just lays down for the trip with no stress at all. He is friendly and doesn't seem to be a marker at all. He was fine with the small white dog he met in his foster home but still needs to be tested with cats. Eddie has liked the children he has met. More as we get to know him.